There are not many rivers left in India that are still untouched! “Aghanashini” is one such rare and unique river. Aghanashini is unique in two aspects. First, it still flows in the same natural course since thousands of years due to the absence of any dams. Second, it doesn’t have any industries along its course. So its water is pure throughout the year. In an era where development is the mantra that everyone is chanting, India still holds a river that is left almost untouched! 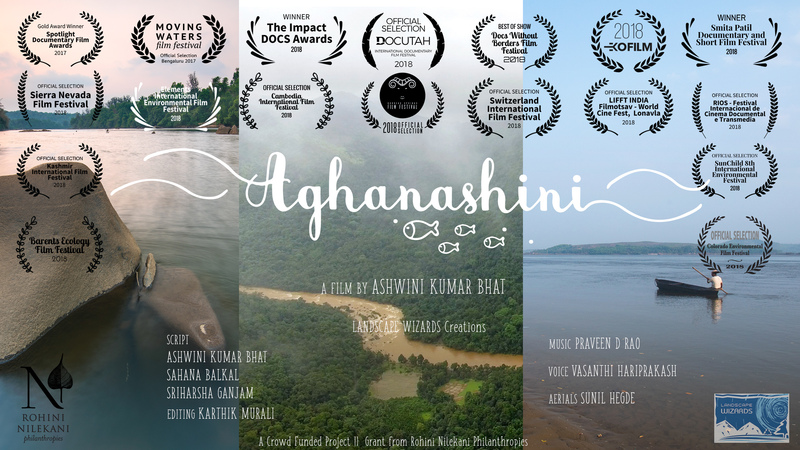 Aghanashini stands as a testimony for how a river can nurture the life of humans and other living beings along its path, equally, if left for flowing free. The documentary covers the river from four different perspectives. We have carried out extensive study and lot of discussions with various resource persons to arrive at a set of stories via which we have told the story of the river – from its origin till it meets the sea. The stories that are chosen are very unique ones, some of which are found nowhere else in the world and some of which are told for the very first time. The team took about two years to make this film. This film covers some of the very unique aspects of the river that is being discovered for the very first time. For instance, the presence of “Moonbow” in one of its waterfalls. Moonbow is a rainbow formed because of moonlight! This is the very first record of a moonbow from Asia! Similarly, there are many untold stories of various facets of the river that is being told for the very first time to the outside world. This is an initiative that is partly supported by Crowd Funding and partly by Rohini Nilekani Philanthropies. The film is being screened at various private and public places, including schools and other institutions all across Karnataka and outside. Contact us in case if you want to host a screening at any place.